The provincial capital of Alajuela lies about 18km to the north west of San Jose and is the second most important city in Costa Rica. 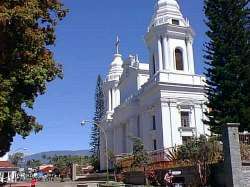 Alajuela lies on a gently sloping hill about 200m lower than the capital and is renowned for its excellent weather and the warmth of its people. Alajuela offers tourists all of the comforts and services that they would need without going into the capital's hustle and bustle. It is a natural starting point for routes that lead to the most important beaches of the Pacific Coast, National Parks and Natural Reserves in the country, making it an ideal "operations center" from where you can set out to Costa Rica's main tourist attractions. The Juan Santamaria International Airport is only 2.5km outside of Alajuela and makes Alajuela and its surroundings a convenient stopping place for your first night in and/or your last night out. The anniversary of the Battle of Rivas, April 11, is particularly celebrated in Alajuela – hometown of the National Hero, Juan Santamaria. There is a parade and civic events. The Fiesta de Los Mangos is held every July, last over a week, and includes arts and crafts fair, parades and some mild reverlry.